Tabriz has for many centuries been the leading carpet trading centre of Persia, lying as it does on the great Silk Route and close to the border with Turkey; the rugs knotted there have in consequence shown a style rich in innovation and international art influences which have made them among the most famous and highly regarded of all urban Persian carpets. Moreover, as is so admirably demonstrated in this outstanding specimen, the weavers of Tabriz are generally considered the most skilful in Persia, able to knot virtually any design with incomparable flair and unrivalled excellence. The superbly rendered mahi, or 'fish', Herati patterning and medallion composition of this item possesses all the clarity of expression, perfect sense of proportion and wonderful handling of colour which have become synonymous with the finest Tabriz work. 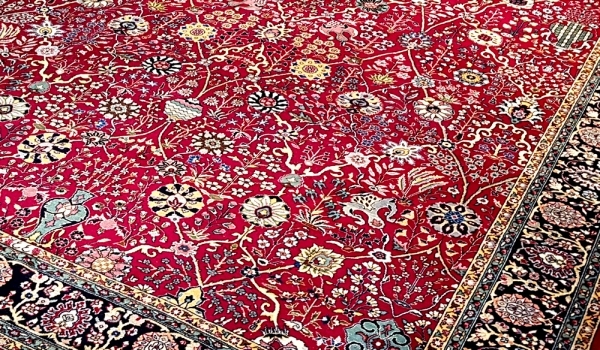 An indication of the item's superlative quality is revealed in the substantial use of silk in the carpet's pile. 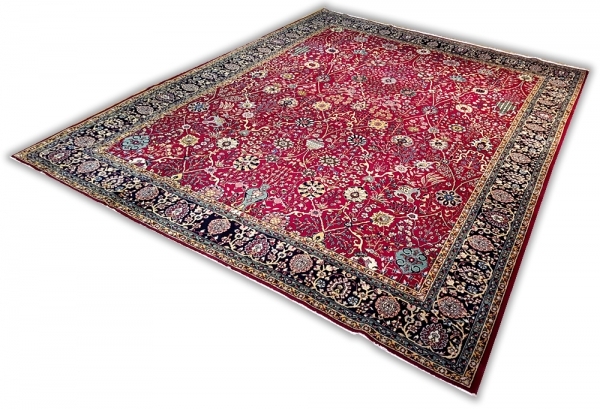 50 raj, hand knotted, perfect condition. Circa 1940.